Well, the kitchen is back to normal except for the jar bands that are currently drying on the counter. The canning went about as smooth as canning can go with a couple minor incidents neither of which broke, mamed or permanently hurt anything. I arrived home as quickly as I could and eager to get started after a typical day in the brown truck with the exception that I used my break and lunch time to go shopping at Meijer for the additional supplies I'd need for the evening's adventure. One small delay was that Parr Roofing and his crew of two were there strapping the ladder to the roof of his pick up truck. Couldn't find Rick and later learned he was "touring the grounds" and greatly admired my wall of overgrown ivy. I pointed at the propagation experiment I have going and informed him that he was more than welcome to whatever ivy I have growing inside. Heck, I'd even plant a whole flat for him if he makes us a deal on the roof repair! Rick Parr and I go back to the days and dealings of volunteering for the community organization. Anyway, it was good to see the old southern man again.... now get out... I have canning to do! 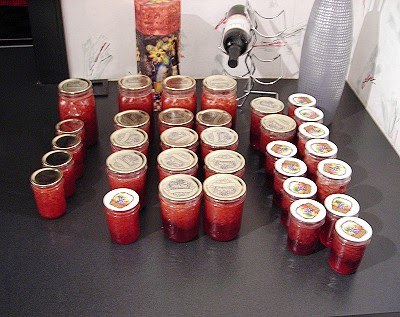 Actually the canning went well except for that first pot of sugary syrupy strawberry mixture bubbling over onto the stove creating a black gooey burning sugar mess on the stove top; thank goodness for our flat top stove or I'd have never gotten that mess cleaned up. I somehow lost the directions for making up the jelly using the "no sugar needed pectin" so I was dashing back and forth from the kitchen to my upstairs office where I was Googling like mad to find the directions; I did find them on the Ball (the jar maker) website. Later I was using the tongs to try to pull up the handles for the jar basket and forgot that the tongs aren't very long and partially emerged my right hand into the very very hot water; I still can't believe I didn't get any blisters from that one. Finished products: 33 jars of various sizes yielding a combined total of about 60 cups of the smile making red goop. I can't wait to try the "no sugar needed" jam since it didn't separate after spooning it into the jars. Reason? I can really only figure it was the difference in the pectins or I'm really thinking it was the 1 cup of unsweetened apple juice that I have frozen from last year's applesauce making. Oh yeah, I revisited the clinic yesteday after my first visit on 6/21. I do feel like it's getting better, but there's still that looming idea that it's really not getting better and that it's gotten as good as it's going to get and if it does wind up feeling fine again that it will just be a matter of time before it gives again. After all it's been 4 1/2 years (13/2/03) since I banged the crud out of it on that fire hydrant. My last visit I saw Dr. Duprey and he mentioned 3 things it could be... 1) meniscus injury 2) MCL strain 3) brusing of the meniscus. I'm hate to be the pessimist here but if were 2 or 3 would I have been feeling it since the fire hydrant incident?